Rahul Gandhi Tells Indians In Bahrain There's "Serious Problem At Home"
Rahul Gandhi promised to deliver a "new shining Congress party" in the next six months. Congress chief Rahul Gandhi, who is on a visit to Bahrain, on Monday made his case before the Indians residing there, delivering another sharply critical speech that took on the Narendra Modi government. Delegates of 50 countries participated in the valedictory session of a function, where the 47-year-old, who recently took over the reins of India's largest party, is the chief guest. "I am here to tell you what you mean to our country, that you're important, to tell you there is a serious problem at home, to tell you that you're part of the solution and that I am here to build a bridge between wherever you are in the world and home," he said in his address to the Global Organisation of People of India Origin. In his address - the first since he took over as the Congress chief - Mr Gandhi kept his focus on the problems of the young and alleged that the BJP-led government was trying to benefit from it. He accused the government of dividing people on the basis of caste and religion and said it was channelling the fear of jobless young people into "hatred between communities". 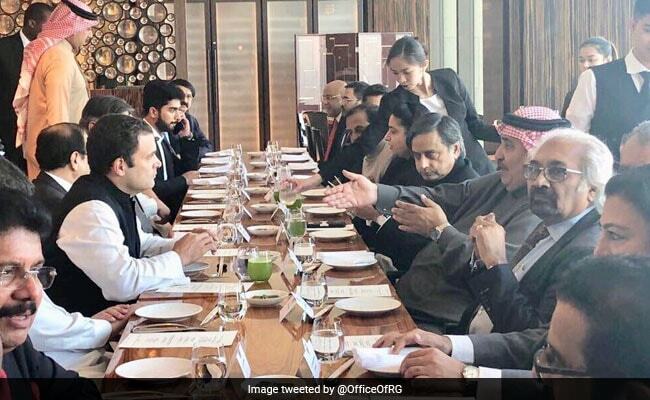 Sheikh Khalid bin Ahmed Al Khalifa hosted lunch for the Congress President. Hinting that there will be dramatic changes in the Congress, Mr Gandhi promised to deliver a "new shining Congress party" in the next six months, said his top three priorities would be to create jobs, good health infrastructure and an education system. Ahead of his visit, Mr Gandhi had tweeted he was looking forward to the meeting and called NRIs the brand ambassadors of the nation and "true representatives" of her soft power. Over the last few months, Mr Gandhi had taken a page out of Prime Minister Narendra Modi's book, addressing Indians during his visit abroad. His two-week visit to US last September had signaled what is being seen as the turnaround of the Congress leader, whom critics have accused of a lack of leadership skills. At New York, Princeton and Berkeley, he had criticised the policies of the government, praised Prime Minister Narendra Modi's communication skills and admitted the lapses of his own party. On social media, his sharper tweets have been gaining traction. In the recent assembly elections in BJP-ruled Gujarat - considered the bellweather before the 2019 general elections - the Congress has managed to notch up its highest score in 35 years in face of a campaign where the BJP had pulled all stops.